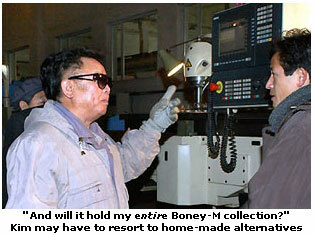 The US is bringing out the big guns to punish North Korea’s Kim Jong-il, taking away his iPod priveleges. The US has banned exports of iPods, fine wines and fast cars to North Korea as part of the punishment for the country’s nuclear bomb test last year. The sanctions are said to be targeted at North Korea’s elite, who reportedly enjoy luxuries, despite the country’s poverty. The banned list includes cognac – said to be the favourite tipple of North Korean leader Kim Jong-Il – as well as jet skis, jewellery and designer clothes. The United Nations banned the sale of luxury goods to North Korea in response to its nuclear test on 9 October, but left individual countries to define those items. His iPod privileges are loose? Perhaps he’d better start behaving better, else those privileges might be something he would LOSE.